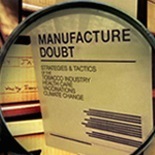 The documentary Merchants of Doubt tells the story of how a cadre of influential scientists with extensive political connections ran effective campaigns to mislead the public and deny well-established knowledge about subjects from tobacco to climate change. This documentary takes audiences on a satirically comedic yet illuminating ride into the heart of conjuring American spin. Filmmaker Robert Kenner lifts the curtain on a secretive group of highly charismatic, silver-tongued pundits-for-hire who present themselves in the media as scientific authorities – yet have the contrary aim of spreading maximum confusion. This free screening, presented by the First Amendment Committee of Indivisible Berkeley, will be followed by discussion.